Most of my diving has been in cold water. Not just the American definition of cold water, being anything less than 18ºC, but properly cold! UK winter diving of 5-6ºC for example, or Arctic Russia and Antarctic winter diving with sea temperature down to -1.8ºC, together with air temperature down to -20ºC. Perhaps it’s the splendour of travelling to dive by skidoo, ice particles glinting in reflected sunlight all around, breathe freezing on the scarf around my neck. Or is it the battle with the elements, when spindrift snow enters every crevice of clothing and covers the newly cut ice-hole. Or the continuous struggle to keep equipment warm and dry, to prevent freshwater ice from entering then regulator and causing a free-flow. Excitement is present with every dive, senses ready to detect the first rattle of ice forming in the regulator, a pull on the rope to signal a problem, or the eerie whistle of a seal singing beneath the ice! Diving during the Antarctic winter is an extraordinary experience and I feel very lucky to have had this rare opportunity. The Antarctic continental land exhibits extremes in physical characteristics and severity of climate. But underwater, seasonal sea temperature fluctuations are minimal, often varying only between +1 to -2ºC, making Antarctic waters one of the most thermally constant environments in the world. These cold waters, however, have a vast seasonal change in nutrients, providing abundant summer food to an array of marine organisms. Summer diving may resemble diving in pea-soup during plankton blooms, but in winter the visibility allows spectacular diving conditions. As the sea freezes, wind no longer stirs up the surface. Sea ice restricts light filtering to the water beneath, limiting plankton and algal growth. Particles settle out of the water column, icebergs ground and become fixed in the frozen surface. 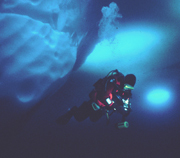 The challenge of SCUBA diving in these conditions includes drilling or chain sawing an ice-hole, protecting equipment against cold, keeping the tender on the surface warm against raw winds and freezing temperatures, and working as a team to ensure safe underwater work, managing scientific instruments and cameras whilst wearing 8mm thick neoprene mitts! Under-ice diving is becoming more accessible to the adventurous (or mad?!) diver as centres in Russia, Norway and Canada run ice-diving courses. When Expedition Medicine first discussed a course in Medicine for Marine Environments, I thought that encompassing this with under ice diving would be ideal! The idea didn’t last for more than a breathe, and anyone wishing to go on the course will be pleased to hear that it will be run in Oman – in warm water! The aim of the course is to provide medical and expedition experience for doctors hoping to go on future expeditions. We’ll experience a desert environment, based in a bay beside the Arabian Sea, with local guides and camp staff for support. Geographically we’ll be about 2½ hours south of Muscat, the capital of Oman. The minimum requirement for diving on the course is PADI Open Water Certificate, and there is opportunity before or after the course to gain further dive experience or qualifications at one of the Omani PADI Dive Centres. We aim to provide an unforgettable experience of the marine environment, using daytime sessions of practical skills and lectures in the evenings, to enhance your understanding and enjoyment of the marine environment, and to enable you to be a bonus to any expedition. Fitness to dive, diving equipment, water rescue, boat handling, search and rescue techniques, dangerous marine creatures, sea kayaking…and more! The course speakers have a vast range and depth of experience. Dr Mark Reid is an expert on marine animals and has previously worked alongside Steve Irwin. He has organised and led many diving expeditions. Mark Hannaford, Managing Director of EML is a power boat instructor, Director of Across the Divide Expeditions and leader of many desert expeditions. Rob Conway is a doctor form London, working at the Mayday Hospital London, who is also the founder and medical advisor for Blue Ventures. I have experience in diving Medicine from the hyperbaric units in both Aberdeen and Plymouth, and have conducted diving research whilst working in the Antarctic. I hope to give lectures on decompression illness, decompression theory, and under-ice diving! Oman is a safe and friendly country that welcomes western visitors. Dress requirements are m ore relaxed than many neighbouring countries, and head cover is not required for women outside mosques. The rugged interior contains mountain ranges contrasting dramatically with desert plains and interspersed with lush valleys. The coastline is over 1000 miles long, with areas where mountains plunge directly into the Arabian Sea. Oman offers the best diving in the Gulf. Underwater visibility consistently ranges between 15 – 25 metres. During October, the air temperature should be a pleasant 25-30ºC, but several degrees cooler at night. We will be staying in tents, with meals provided by local cooks. Sea temperatures are expected to be between 24-28C, thus probably only requiring a 5mm wetsuit. During the summer months (April to September), as the sea temperature rises, a 3mm wetsuit would suffice. The range of marine life is amazing! There are a large number of endemic corals that have learnt to survive in sea temperatures above their normal temperature (over 30C during summer!). We hope to sea Spinner dolphins on the surface, and beneath the waves the colours will amaze you! Coral varieties include Table, Brain, Stag and Teddy Bear corals; several varieties of moray eel – Zebra, Honeycomb; sharks such as Lemon and Black-tip Reef sharks; turtles, lobsters, Sting Rays, Eagle Rays, sea cucumbers, octopi, sea slugs, various sea anenomes, Barracuda, Blue Triggerfish, Spotfin Lionfish, Blue Tang, Cornetfish, Parrot Fish, – to name only a few of the myriad species! So, if you’re one to get excited about diving a new environment, and want to learn expedition techniques whilst enjoying an exotic location, come and join us!